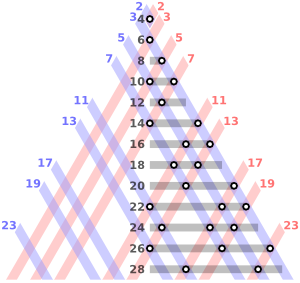 The even integers from 4 to 28 as sums of two primes: Even integers correspond to horizontal lines. For each prime, there are two oblique lines, one red and one blue. The sums of two primes are the intersections of one red and one blue line, marked by a circle. Thus the circles on a given horizontal line give all partitions of the corresponding even integer into the sum of two primes. Every even integer greater than 2 can be expressed as the sum of two primes. The conjecture has been shown to hold for all integers less than 4 × 1018, but remains unproven despite considerable effort. The number of ways an even number can be represented as the sum of two primes. A Goldbach number is a positive even integer that can be expressed as the sum of two odd primes. Since four is the only even number greater than two that requires the even prime 2 in order to be written as the sum of two primes, another form of the statement of Goldbach's conjecture is that all even integers greater than 4 are Goldbach numbers. 0, 1, 1, 1, 2, 1, 2, 2, 2, 2, 3, 3, 3, 2, 3, 2, 4, 4, 2, 3, 4, 3, 4, 5, 4, 3, 5, 3, 4, 6, 3, 5, 6, 2, 5, 6, 5, 5, 7, 4, 5, 8, 5, 4, 9, 4, 5, 7, 3, 6, 8, 5, 6, 8, 6, 7, 10, 6, 6, 12, 4, 5, 10, 3, ... (sequence A045917 in the OEIS). Letter from Goldbach to Euler dated on 7. June 1742 (Latin-German). Goldbach's third version (equivalent to the two other versions) is the form in which the conjecture is usually expressed today. It is also known as the "strong", "even", or "binary" Goldbach conjecture, to distinguish it from a weaker conjecture, known today variously as the Goldbach's weak conjecture, the "odd" Goldbach conjecture, or the "ternary" Goldbach conjecture. This weak conjecture asserts that all odd numbers greater than 7 are the sum of three odd primes, and appears to have been proved in 2013. The weak conjecture is a corollary of the strong conjecture, as, if n – 3 is a sum of two primes, then n is a sum of three primes. The converse implication, and the strong Goldbach conjecture remain unproven. For small values of n, the strong Goldbach conjecture (and hence the weak Goldbach conjecture) can be verified directly. For instance, Nils Pipping in 1938 laboriously verified the conjecture up to n ≤ 105. With the advent of computers, many more values of n have been checked; T. Oliveira e Silva is running a distributed computer search that has verified the conjecture for n ≤ 4 × 1018 (and double-checked up to 4 × 1017) as of 2013. One record from this search is that 3,325,581,707,333,960,528 is the smallest number that has no Goldbach partition with a prime below 9781. Statistical considerations that focus on the probabilistic distribution of prime numbers present informal evidence in favour of the conjecture (in both the weak and strong forms) for sufficiently large integers: the greater the integer, the more ways there are available for that number to be represented as the sum of two or three other numbers, and the more "likely" it becomes that at least one of these representations consists entirely of primes. Since this quantity goes to infinity as n increases, we expect that every large even integer has not just one representation as the sum of two primes, but in fact has very many such representations. This is sometimes known as the extended Goldbach conjecture. The strong Goldbach conjecture is in fact very similar to the twin prime conjecture, and the two conjectures are believed to be of roughly comparable difficulty. The Goldbach partition functions shown here can be displayed as histograms which informatively illustrate the above equations. See Goldbach's comet. The strong Goldbach conjecture is much more difficult than the weak Goldbach conjecture. Using Vinogradov's method, Chudakov, Van der Corput, and Estermann showed that almost all even numbers can be written as the sum of two primes (in the sense that the fraction of even numbers which can be so written tends towards 1). In 1930, Lev Schnirelmann proved that any natural number greater than 1 can be written as the sum of not more than C prime numbers, where C is an effectively computable constant, see Schnirelmann density. Schnirelmann's constant is the lowest number C with this property. Schnirelmann himself obtained C < 800,000. This result was subsequently enhanced by many authors, such as Olivier Ramaré, who in 1995 showed that every even number n ≥ 4 is in fact the sum of at most six primes. The best known result currently stems from the proof of the weak Goldbach conjecture by Harald Helfgott, which directly implies that every even number n ≥ 4 is the sum of at most four primes. Chen Jingrun showed in 1973 using the methods of sieve theory that every sufficiently large even number can be written as the sum of either two primes, or a prime and a semiprime (the product of two primes). See Chen's theorem for further information. exceptions. In particular, the set of even integers which are not the sum of two primes has density zero. In 1951, Linnik proved the existence of a constant K such that every sufficiently large even number is the sum of two primes and at most K powers of 2. Roger Heath-Brown and Jan-Christoph Schlage-Puchta in 2002 found that K = 13 works. As with many famous conjectures in mathematics, there are a number of purported proofs of the Goldbach conjecture, none of which are accepted by the mathematical community. Although Goldbach's conjecture implies that every positive integer greater than one can be written as a sum of at most three primes, it is not always possible to find such a sum using a greedy algorithm that uses the largest possible prime at each step. The Pillai sequence tracks the numbers requiring the largest number of primes in their greedy representations. One can consider similar problems in which primes are replaced by other particular sets of numbers, such as the squares. It was proven by Lagrange that every positive integer is the sum of four squares. See Waring's problem and the related Waring–Goldbach problem on sums of powers of primes. Hardy and Littlewood listed as their Conjecture I: "Every large odd number (n > 5) is the sum of a prime and the double of a prime." (Mathematics Magazine, 66.1 (1993): 45–47.) This conjecture is known as Lemoine's conjecture (also called Levy's conjecture). The Goldbach conjecture for practical numbers, a prime-like sequence of integers, was stated by Margenstern in 1984, and proved by Melfi in 1996: every even number is a sum of two practical numbers. ^ a b Weisstein, Eric W. "Goldbach Conjecture". MathWorld. ^ Silva, Tomás Oliveira e. "Goldbach conjecture verification". www.ieeta.pt. ^ "Goldbach's Conjecture" by Hector Zenil, Wolfram Demonstrations Project, 2007. ^ Weisstein, Eric W. "Goldbach Number". MathWorld. ^ Ingham, AE. "Popular Lectures" (PDF). Archived from the original (PDF) on 2003-06-16. Retrieved 2009-09-23. ^ Caldwell, Chris (2008). "Goldbach's conjecture". Retrieved 2008-08-13. ^ Helfgott, H.A. (2013). "Major arcs for Goldbach's theorem". arXiv:1305.2897 [math.NT]. ^ Helfgott, H.A. (2012). "Minor arcs for Goldbach's problem". arXiv:1205.5252 [math.NT]. ^ Pipping, Nils (1890-1982), "Die Goldbachsche Vermutung und der Goldbach-Vinogradovsche Satz." Acta Acad. Aboensis, Math. Phys. 11, 4–25, 1938. ^ Fliegel, Henry F.; Robertson, Douglas S. (1989). 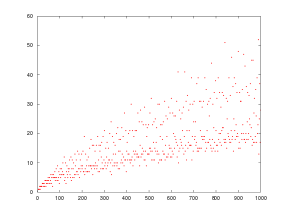 "Goldbach's Comet: the numbers related to Goldbach's Conjecture". Journal of Recreational Mathematics. 21 (1): 1–7. ^ Chudakov, Nikolai G. (1937). "О проблеме Гольдбаха" [On the Goldbach problem]. Doklady Akademii Nauk SSSR. 17: 335–338. ^ Van der Corput, J. G. (1938). "Sur l'hypothèse de Goldbach" (PDF). Proc. Akad. Wet. Amsterdam (in French). 41: 76–80. ^ Estermann, T. (1938). "On Goldbach's problem: proof that almost all even positive integers are sums of two primes". Proc. London Math. Soc. 2. 44: 307–314. doi:10.1112/plms/s2-44.4.307. ^ Schnirelmann, L.G. (1930). "On the additive properties of numbers", first published in "Proceedings of the Don Polytechnic Institute in Novocherkassk" (in Russian), vol XIV (1930), pp. 3-27, and reprinted in "Uspekhi Matematicheskikh Nauk" (in Russian), 1939, no. 6, 9–25. ^ Schnirelmann, L.G. (1933). First published as "Über additive Eigenschaften von Zahlen" in "Mathematische Annalen" (in German), vol 107 (1933), 649-690, and reprinted as "On the additive properties of numbers" in "Uspekhi Matematicheskikh Nauk" (in Russian), 1940, no. 7, 7–46. ^ Helfgott, H. A. (2013). "The ternary Goldbach conjecture is true". arXiv:1312.7748 [math.NT]. ^ Sinisalo, Matti K. (Oct 1993). "Checking the Goldbach Conjecture up to 4 1011" (PDF). Mathematics of Computation. American Mathematical Society. 61 (204): 931–934. CiteSeerX 10.1.1.364.3111. doi:10.2307/2153264. JSTOR 2153264. ^ Rassias, M. Th. (2017). Goldbach's Problem: Selected Topics. Springer. ^ Chen, J. R. (1973). "On the representation of a larger even integer as the sum of a prime and the product of at most two primes". Sci. Sinica. 16: 157–176. ^ Heath-Brown, D. R.; Puchta, J. C. (2002). "Integers represented as a sum of primes and powers of two". Asian Journal of Mathematics. 6 (3): 535–565. arXiv:math.NT/0201299. doi:10.4310/AJM.2002.v6.n3.a7. ^ Sloane, N. J. A. (ed.). "Sequence A066352 (Pillai sequence)". The On-Line Encyclopedia of Integer Sequences. OEIS Foundation. ^ Margenstern, M. (1984). "Results and conjectures about practical numbers". Comptes Rendus de l'Académie des Sciences. 299: 895–898. ^ Melfi, G. (1996). "On two conjectures about practical numbers". Journal of Number Theory. 56: 205–210. doi:10.1006/jnth.1996.0012. Montgomery, H. L. & Vaughan, R. C. (1975). "The exceptional set in Goldbach's problem" (PDF). Acta Arithmetica. 27: 353–370. doi:10.4064/aa-27-1-353-370. Goldbach's conjecture, part of Chris Caldwell's Prime Pages. Goldbach conjecture verification, Tomás Oliveira e Silva's distributed computer search.